Everyone knows that a long list of celebritys accredit a large proportion of their incredible physiques to colonics and detox. 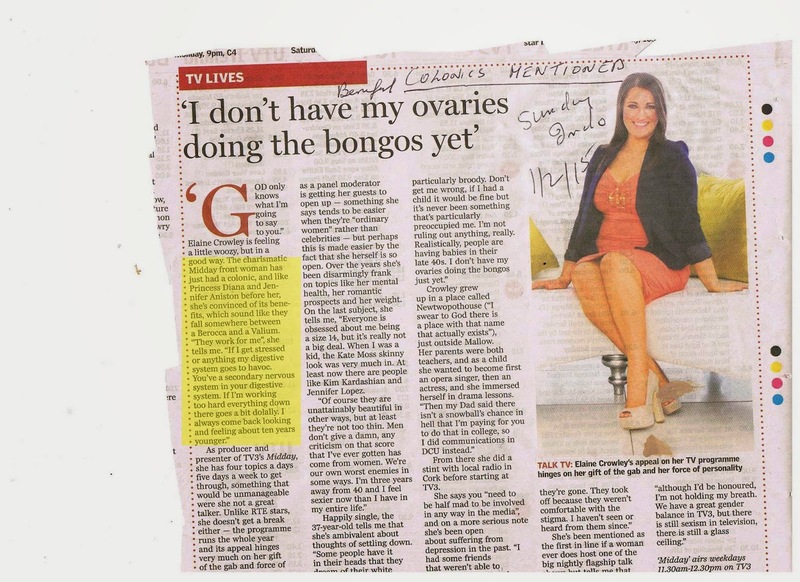 Elaine Crowley spoke about her experiences with Colonic Irrigation in this Sunday Independents Living Section. "If I get stressed or anything my digestive system goes to havoc. You've a secondary nervous system in your digestive system. If Im working too hard everything down there goes doolally. I always come back looking and feeling ten years younger. " Sunday Independent Living 1st February 2015. Of course Elaine is just one of a long list of celebritys to rate highly the value of colonic Irrigation and juicing. In a recent article in The Irish Daily Mail entitled "Meet You At The Oxygen Bar" Wednesday 5th January 2015, the secrets of celebrity detox and colonics have been revealed. At We Care in Palm Springs, colonic center popular with celebritys and based in the USA, a full detox cleanse is provided which includes juice fasting , colonics and coffee enemas, lymphatic massage and natural facial treatments. The clinic recommends herbal tea, juices and vegetable soups. Olive and prune juice are advised in advance of the daily colonic hydrotherapy sessions. At Dublin Vitality all of this is available, but its possible to do the programme without leaving Ireland. We Care in Palm Springs are part of the IACT association of colonic hydrotherapists the same professional group as Dublin Vitality Center. IACT is the only training programme recognised by US Federal law. In the USA colonic hydrotherapists are regulated as a profession. In Ireland, Dublin Vitality Center is the only clinic which has IACT trained to include Foundation, Intermediate and Advanced Level. Celebrity Clients: Gwyneth Paltrow, Ben Affleck, Gwen Steffani, Live Tyler, Matt Damon, Paris Hilton. You can have a similar detox at Dublin Vitality Center with our highly effective 90 minute programme known as Inchloss Detox Express.